We deviated from our typical Seattle Routine of driving into the city for some urban exploration and photography and opted for a different approach, utilizing the services of Seattle Helitours. They operate a small fleet of Robinson R22 and R44 helicopters, picking up passengers from Boeing Field in Seattle. From a list of pre-selected flight paths we chose a route that takes us around downtown Seattle and looped us counter-clockwise around the city. That flight path flew us over our old Beacon Hill neighborhood heading North/North East towards Lake Washington, as far North as the UW campus and Northgate, then back South/South West past the Ballard Locks, Gas Works Park, Lake Union, and downtown Seattle. Once past the Space Needle we flew over Seattle’s waterfront and the viaduct, over the two stadiums, then back to Boeing field. As you can see the view of our city from every angle is amazing. If we had the choice we would’ve stayed up there all day. It was our first experience in a helicopter and certainly not our last. 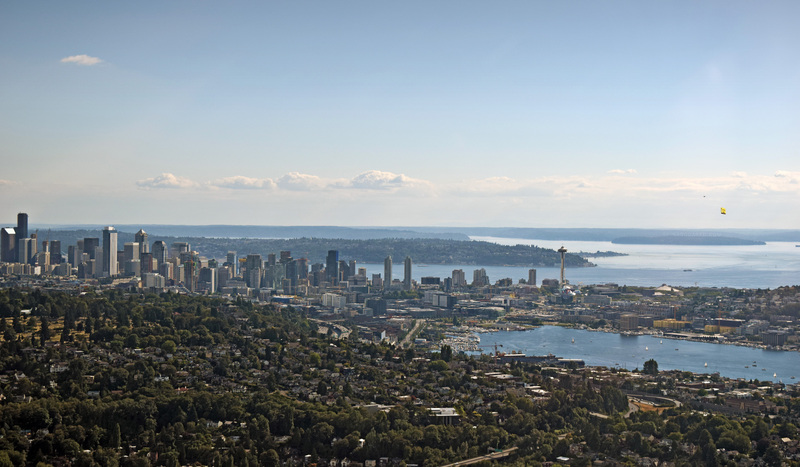 We hope to go up again to see more of Seattle from above.